Calicut/Kozhikode is a major city and a prime tourist attraction in Kerala. Read the article to know more about the tourist attractions of Kozhikode. Calicut (also known as Kozhikode) is a major city and one of the prime tourist attractions in Kerala. For centuries, Kozhikode remained an important port for trade and commerce in the state. It was a prominent trade centre, from where black pepper and cardamom were supplied to Arabs, Jews, Phoenicians and Chinese. It is also the same place where the famous traveler Vasco da Gama landed in 1498. All through the years, Kozhikode has retained its status of being an important commercial and trade centre of Kerala. The district offers wonderful experience to its visitors, through its backwaters tours. House boats in Calicut offer the visitors the pleasure of luxury ride and the opportunity to explore the backwaters of Kerala. Located just five kilometers from railway station, Krishna Menon Museum is dedicated to the great Indian leader V.K Krishna Menon. Apart from displaying the personal belongings and memorabilia of this great leader, the museum also houses considerable size of paintings made by Raja Raja Varma and Raja Ravi Varma. The museum is located next to Pazhassi Raja Museum. Located 11km south of Kozhikode, Beypore Beach is an old port and fishing harbor. It is also the site of traditional ship building yard and is known for making famous Uru. The beach consists of a 2 km bridge made of huge stones, appearing like a pathway to sea. 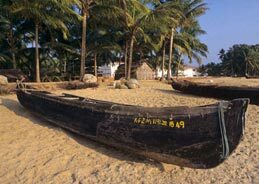 Situated 16km from Kozhikode, Kappad is the historical beach where the famous Portuguese traveler Vasco Da Gama set his feet in 1498. Peruvannamuzhi is situated 60 km from Calicut. It is a popular picnic spot. It consists of the magnificent Peruvannamuzhi Dam lying between the hills. Adding to the beauty of the place is a bird sanctuary and a crocodile farm. Best known for its natural beauty, Peruvannamuzhi, a prominent tourist attraction in Kozhikode, offers facilities of speedboat and rowboat rides for its visitors. Kakkayam is located at a distance of 78 km Kozhikode. It is known for its magnificent waterfalls and dam. There are direct buses services available from Kozhikode to Kakkayam. Situated 68km from Kozhikode, Thusharagiri is the site of three stunning waterfalls, with Western Ghats serving as its backdrop. It is an ideal place for adventure lovers and trekkers, as it contains facilities of trekking and rock climbing. As the name suggests, Dolphin's Point is the point from where visitors can see dolphins playing in the sea. The best time to catch a glimpse of this marvel is during early morning hours. Located just 2 km away from Kozhikode city centre, Dolphin's Point consists of an extensive tree lined beach and other attractions like the Lions Club Park, the lighthouse and two piers. Science Planetarium is an important planetarium located at Jaffarkhan Colony of Calicut. It helps its visitors to understand and unravel the mysteries of universe and know more about planets and stars. Kozhikode Beach is a lovely beach, which offers numerous facilities of adventure sports along with the lip smacking local cuisines. Kids can enjoy their time at the Children’s Park located in the vicinity of the beach. Very closely situated is the Marine Water Aquarium, where one can see the diverse sea life. Calicut International Airport is an international airport from where one can board international and domestic flights. Kozhikode is the nearest railway station. Kozhikode is well connected with other major cities like Mangalore, Kochi, Thiruvananthapuram, and Chennai through wide network of roads.